Roman mythology is to thank for the monikers of most of the eight planets in the solar system. The Romans bestowed the names of gods and goddesses on the five planets that could be seen in the night sky with the naked eye. Jupiter, the solar system’s biggest planet, was named for the king of the Roman gods, while the reddish color of the planet Mars led the Romans to name it after their god of war. Mercury, which makes a complete trip around the Sun in just 88 Earth days, is named after the fast-moving messenger of the gods. Saturn, the solar system’s second-largest planet, takes 29 Earth years to make a full revolution of the Sun and is named for the god of agriculture. The Romans named the brightest planet, Venus, for their goddess of love and beauty. Two other planets, Uranus and Neptune, were discovered after the telescope was invented in the early 1600s. 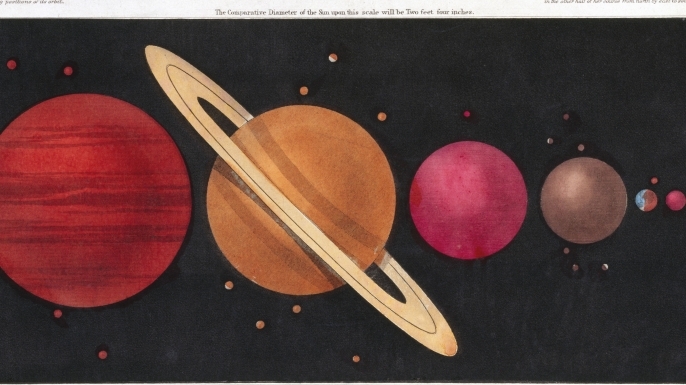 Astronomer William Herschel, who is credited with discovering Uranus in 1781, wanted to call it “Georgium Sidus,” (George’s Star) for the British ruler at the time, King George III. Other astronomers were interested in dubbing the planet Herschel. It was German astronomer Johann Bode who recommended the name Uranus, a Latinized version of the Greek god of the sky, Ouranos; however, the name Uranus didn’t gain full acceptance until the mid-1800s. Neptune, the planet farthest from the Sun (it makes a solar revolution once every 165 years), was first seen by telescope in 1846 by German astronomer Johann Gottfried Galle, using the mathematical calculations of French astronomer Urbain Le Verrier and British astronomer John Couch Adams. There was some discussion of naming the planet after Le Verrier, but ultimately Neptune, which has a vivid blue color, got its name from the Roman god of the sea. Even in space, bureaucracy exists. In December 2018, astronomers announced they’d found the most distant object ever to be observed in our solar system. They’re unofficially calling the giant ice ball, “Farout,” and it is three times farther from the Sun than Pluto.